One of the questions we’re often asked is what happens with the shoes collected during a shoe drive fundraiser? Where do the shoes go? As you know, a 7.0 magnitude earthquake grumbled through Haiti on January 12, 2010. In an impoverished country of fewer than 10 million people, it caused nearly $8 billion in damages. Approximately, 300,000 people were killed, and another 300,000 were injured. Over 1.5 million people were left homeless. In the ensuing years, life has slowly returned to a different normal in this small Caribbean nation. It has been a steady climb back from heartache and devastation, but the spirit of the Haitian people has never been broken. The fact remains, Haiti needs continued and ongoing assistance from others outside of its borders for many years to come. In education, for example, the 2010 earthquake destroyed infrastructure, such as schools and displaced more than 50 percent of the students. The Haitian government has been unable to provide very little financial support, so 90 percent of students attend non-public community, NGO or religious schools, which are operated by individuals primarily from the United States, Canada or France that have stepped in to try to fill the gap. Despite these efforts, however, the literacy rate is only 53 percent. Because of poverty, the need for families to work and no money for basics such as tuition or a school uniform, high dropout and low enrollment rates exist. Haiti still needs business people, educators, doctors, engineers, humanitarians and others to give of their time and expertise. Haiti is a country where 72 percent of the population lives on less than $2 a day, and 80 percent of its citizens live under the poverty line. For Haitians to be able to overcome the ingrained poverty that exists in their nation, one of the most precise solutions is to create work opportunities. Typically, in a developing country, there are few traditional jobs available. With the low level of literacy and obstacles to education precisely because of the poverty, a recurring cycle exists. Families cannot afford a school, and because many parents are uneducated, they have exceedingly low prospects for gainful employment with the few jobs that do exist and the effects of poverty continue to be perpetuated. Wandering through the Marché en Fer, or Iron Market in Port-au-Prince, a traveler can see the entrepreneurial spirit in action. Spices emanate from the Creole cooking, in a frenetic place where thousands of consumers and small business people converge. Haitians who become aware of programs that have been established by NGOs or social enterprises to help support them in creating business opportunities and those who have the spirit to do it on their own sell goods such as food, shoes, clothing or even cell phone chargers. Walking through the market, you may come across someone such as Sylvia. Before the devastation, Sylvia was earning only a couple of dollars per day to provide for her family and children. This gentle, but driven entrepreneur works in the Marché en Fer, having established her small business kiosk where she sells consumer goods. “Before the earthquake, I was making very little money. I did not know how I was going to be able to take care of my son,” she says. Today, she earns approximately $60 per day and seen her son graduate from high school and go onto college. David is another example of an entrepreneur. He has been associated with an international social enterprise that has worked with him since the earthquake. With this organization, he has strengthened his basic math, reading and writing proficiency, and he has been taught fundamental business skills. David started selling shoes that were laid out on a thin carpet near the Marché en Fer. He was able to obtain his inventory from donated shoes that were shipped to Haiti from the United States. David learned that to make money, he would have to invest a little money. With the support of his wife, he decided it was imperative for him to become a small business entrepreneur. When he started, he paid pennies on the dollar for approximately two-dozen shoes. He then took the shoes he purchased home and spent some days getting ready to sell. Finally, he went out to the market with his inventory and neatly laid it out on a thin mat. 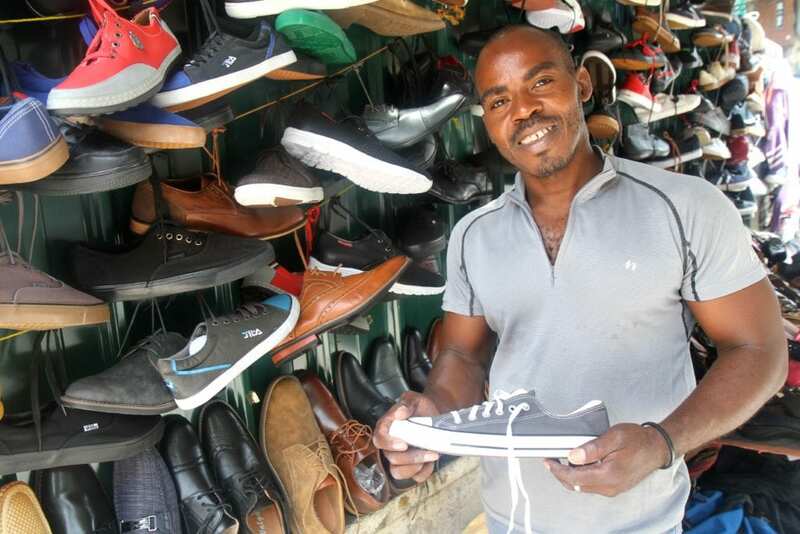 “It was not easy at first, but I was able to sell all my shoes and have enough to help my family and buy more shoes to sell,” David said. Today, David is a successful small business entrepreneur who has helped pay forward what he has learned by developing his wife’s skills, as she joined him. 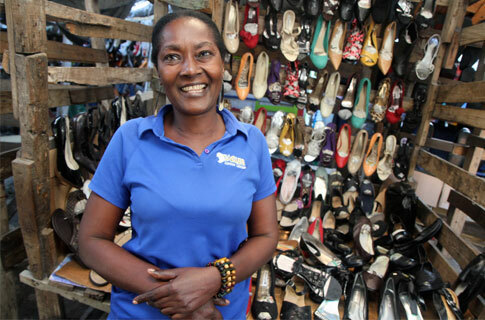 He now purchases and sells hundreds of shoes a year and works closely with other members of his family and friends who have come to him for guidance and seeking to create their own opportunities. International entrepreneurs and service providers remain in Haiti, although in smaller numbers than years ago, and they are working to improve work opportunities, schools, infrastructure, hospitals, and medicine. These philanthropists, volunteers, and experts recognize that Haiti or any other developing nation cannot just come into its own by having money funneled its way, but rather by partnering and empowering the people of the country. One of the key ways to do this is to allow them to be self-sufficient. Providing financing, job training and workplace development for entrepreneurs. Creating work opportunities through agriculture cooperatives focused on helping youth and families to develop work and business skills that will enable them to become self-sufficient with jobs in farming and animal breeding centers. Providing management training workshops to small business owners and prospective entrepreneurs in the textile, tourism and construction sectors. Increasingly, Haitians see that the path to self-sufficiency is through education, good medicine, and entrepreneurship. Some nonprofit and business experts have committed to remain in the country, so many years after their quakes, and help the Haitian people realize their potential. So, contrary to the Haiti that you would have found had you walked its warren of streets and alleyways before the 2010 earthquake, today’s country embodies a place where there is a somewhat of a resurgence of art, business, and education; in other words, there is a bit of hope for their future. When you do a shoe drive fundraiser, the country of Haiti, which is the most impoverished country in the Western Hemisphere, is one of the nations where your gently worn, used and new shoes go. Next time you wonder about a shoe drive fundraiser, remember that you’re giving people living in poverty who are working themselves out of it, hope and opportunity.